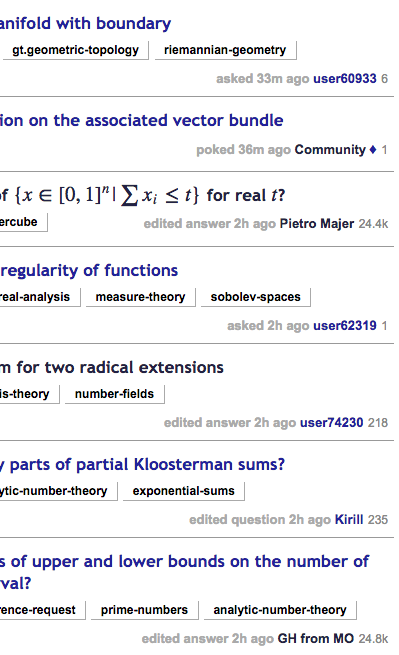 On the page of "top questions" that opens when I go to mathoverflow.net, each question is accompanied by information about what happened to it most recently. The information consists of "asked" or "answered" or "modified", followed by information about who did it and when. I would find it useful if "modified" could be upgraded to indicate whether the modification was in a question or in an answer. (Here "useful" means that it can influence whether I want to look at the question.) It seems that the information I'm asking for should be easily available in the system, so my request would be just to display it on this home page. Thanks to jeq's suggestion, there is an answer on stackapps for that exact purpose! That doesn't mean it shouldn't be a standard feature, but it does mean that you can have this feature right now. Not the answer you're looking for? Browse other questions tagged feature-request user-interface editing . Why doesn't “browse the complete list of questions” continue with next questions?